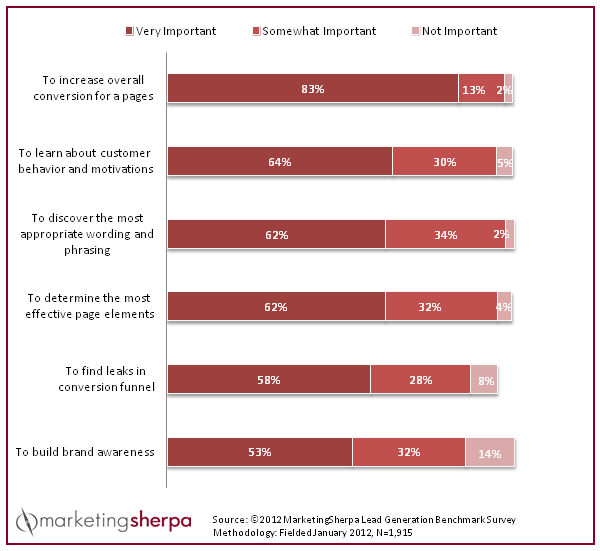 Marketing Research Chart: What are the most prevalent website optimization priorities? SUMMARY: Over the past 10 years, website optimization has matured from measuring softer metrics, such as brand awareness, to tracking core processes like conversion. More advanced strategists now employ sophisticated tactics, including measuring customer behavior and finding conversion funnel leaks. We wanted to learn more about the priorities marketers have for their optimization strategies, so we asked them to rate the most popular website optimization goals, based upon their current priorities. See the results in this week’s chart. Q. Of the following website optimization goals, please rate each in terms of “very important,” “somewhat important,” “not important” or “don't know,” according your company's priorities. As you can see, more than 80% of marketers consider increasing overall conversion as the dominant priority for their website optimization programs. They also consider advanced optimization goals, such as learning about customer motivations and addressing the marketing funnel, as “very important,” with 64% and 58% of marketers, respectively, focused on those goals. More tactical goals, including vetting phrasing and page elements, are also at the forefront, with 62% of respondents saying these were “very important” prioritization goals. Website priorities appear to vary among industry channels, company size and maturity levels. For priorities marked as “very important,” increasing overall conversion was the predominant focus, particularly for those marketing directly to consumers, as 88% of B2C firms rated increasing overall conversion as “very important,” versus 78% of their B2B counterparts. In the coming months, we will be sharing additional research data and insights about website optimization, selected from the upcoming MarketingSherpa 2013 Website Optimization Benchmark Report. Additionally, you can obtain valuable insights on marketing optimization through MarketingSherpa’s library of in-depth optimization research and how-to guides. Editor's Note: After analyzing the social media shares of our marketing research charts, we've noticed a lot of readers have their own analysis of our marketing industry data. So, we're giving you an opportunity to help marketers put our research into action, as well as to be published on the MarketingSherpa blog. Are you a brand-side marketer or marketing vendor with actionable advice based on this week's research chart? Share your top tips and tactics for a chance to be featured in a future MarketingSherpa blog post based on this research chart. Include your advice on the MarketingSherpa LinkedIn discussion board, as either a comment or a link to your blog post where you offer advice based on this data.